This is one of the most artistic and personal bar mitzvah cakes I have ever photographed. 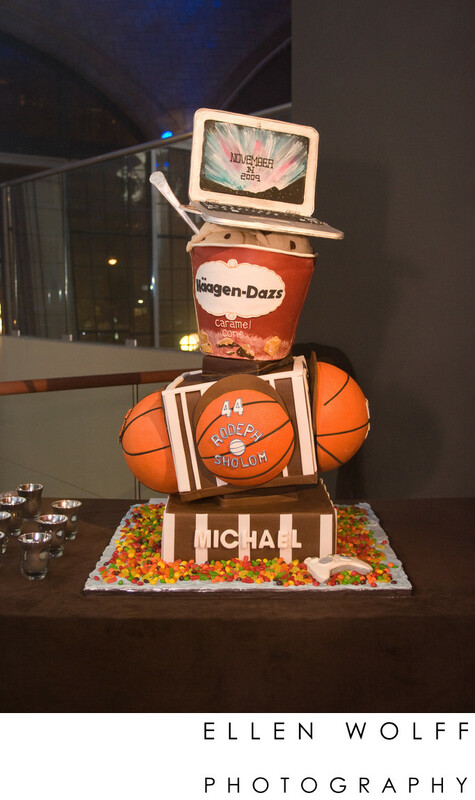 This custom bar mitzvah cake features several huge tiers: the top layer is a replica of a laptop, the next layer down is a Haagen-Dazs ice cream container with the bar mitzvah boys favorite flavor, giant basket balls are next. You can see the name of his school and his name spelled out in chocolate, at the base layer. Location: 409 E 59th St, New York, NY 10022. Keywords: Bar Mitzvah (66), cake (9), Guastavino's (6), Temple Rodeph Sholom (3).